“Product images provided by shop owners are not enough for me when I consider making an online purchase!”. 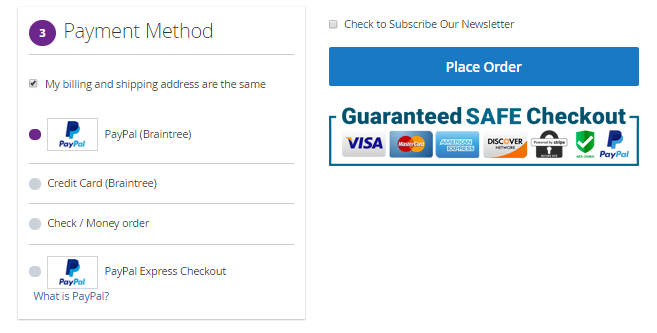 Explore this extension to give your customers a chance to experience what actual products look like and decide to place an order without hesitance. The ability to physically confirm the items’ quality is one of the main reasons why people choose shopping in-store rather than buying online. Especially, when it comes to fashion e-commerce, 87% of people are afraid of online purchases due to the suspicion of the items’ fit. Beside the product content by providers, online buyers might want to consider actual experience from other customers. Therefore, Magento 2 Product Images by Customer extension can be a perfect choice to let users add images of products to your website to share such actual experience. As you see, this is absolutely a smart-but-free way to advertise your products. Customers play an important part in helping you enhance your product trust. Pushing sales, as a result, is under your control! 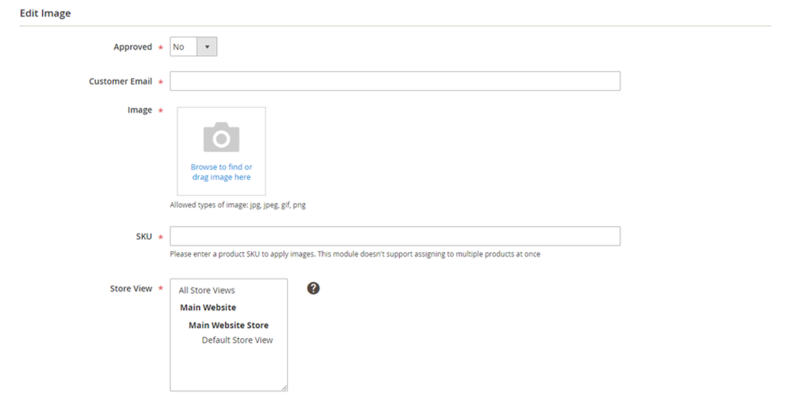 In order to decide which images are suitable to display, admin can approve/ disapprove/ delete one by one or multiple customer image requests. Approved images would be shown in an eye-catching slider which can be customized with slideshow speed, number of images and image dimensions. With only $79, Magento 2 Product Images by Customer can offer you more ideal features than other vendors. Setup this extension to see that improving brand trust is in your hands! 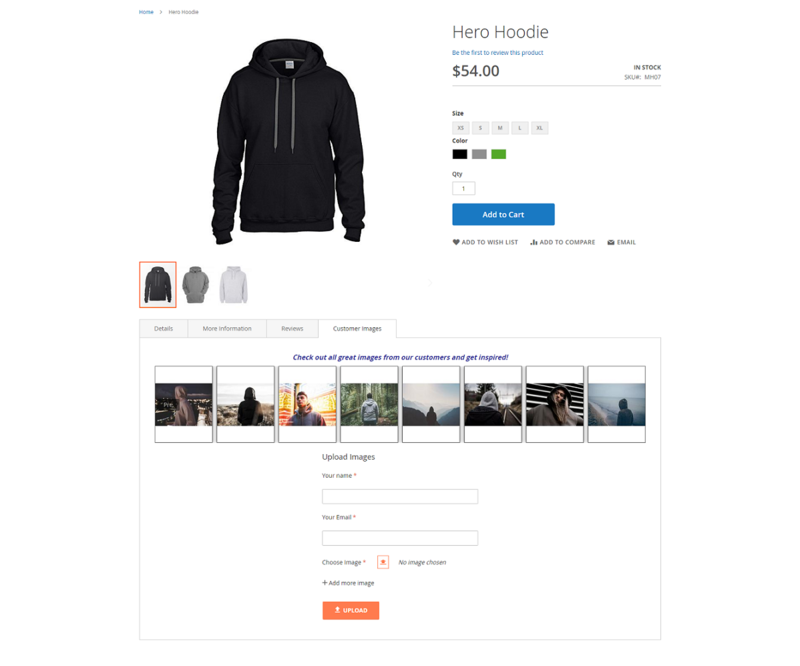 With your Magento 2 Product Images by Customers, my customers share that they can now check how items look like in reality, so they can make purchase decision quickly. As a result, my sales increased significantly last month. Big thanks. Your Magento 2 Product Images extension is good enough, but I just wanted to add some small features to make it even more fancy for my customers, so I asked your support team. They responsed and solved it quickly. Look forward to other extensions. Every feature works as described. I'm pretty satisfied with your Magento 2 Product Images by Customer extension. All features run smoothly as your promised. 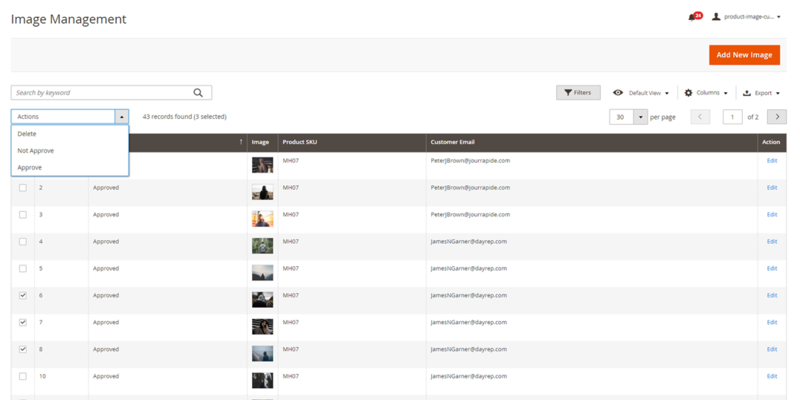 Just wonder whether your team can recommend me more extensions to improve product page content? Thanks a lot! Whenever I look for Magento 2 extensions, I visit your site. This time, Product Images by Customers lives up to all my expectation. Big thanks and keep up the good work! This is the must-have extension for fashion stores. It is an effective way to get feedback from customers and prove the product quality.